Can Snoring Really Kill You? There has been quite a bit of attention drawn towards snoring these days. Millions of us either snore or deal with a snoring partner each night. Aside from being a nuisance for your partner, did you know that snoring can actually kill you? To be more specific, the act of snoring doesn’t actually kill, but it’s often a symptom of a more serious medical condition known as Obstructive Sleep Apnea (OSA). OSA is a medical condition that affects an estimated one in twenty-five middle-aged men and one in fifty middle-aged women. Overall, there are an estimated 20 million Americans who have sleep apnea and many will show symptoms such as loud snoring, pauses in breathing, and wake up short of breath. OSA places a strain on your cardiovascular system and can lead to a heart attack or stroke among several other issues. As for snoring, it’s estimated that ninety million American adults snore or about one in three over the age of 18. Snoring not related to other medical conditions such as OSA is known a “benign snoring” and does not pose a hazard to your health in itself. To recap, there are 90 million snorers and 20 million people who have Obstructive Sleep Apnea, many who are also snorers. If you snore, how can you tell the difference between a potentially dangerous condition such as OSA and benign snoring? As mentioned, benign snoring is not an issue while sleep apnea is. Is there a way to tell if your snoring is just snoring or if it’s an indication of sleep apnea? Only a properly trained medical professional can determine the likelihood and ultimately diagnose sleep apnea through a test known as a sleep study. Your doctor may have you complete a questionnaire such as the STOP-BANG before deciding your risk for OSA and whether or not further testing is warranted. There are several symptoms of sleep apnea that you should watch out for. If you experience some or all of the symptoms, it’s a good idea to speak with your doctor who can further evaluate your situation. Overweight- While not all with sleep apnea are overweight and not all who are overweight have sleep apnea, there is a definite correlation between the two. Excessive stored fat, particularly in the neck area, can cause the airway to close up and significantly reduce your ability to properly breathe while sleeping. Women with a neck measurement of 16″+ and men with a neck measurement of 17″+ are at higher risk. If you are overweight or obese, losing even 10-15 lbs can dramatically help with snoring and OSA. Loud snoring – You may be a habitual snorer and not even know it. If you have a bed partner who often complains about your snoring, ask them how often you snore and how intense your snoring is. You may even want to record yourself at night to capture your snoring. There are several smartphone apps that will make this easy. Sleep apnea sufferers will often snore loudly and throughout the night. Snoring can even become so loud that it can be heard through the walls. Pauses in breathing- Does your partner tell you that you often stop breathing while asleep? Sleep apnea is characterized by pauses in breathing while asleep. These pauses may last for several seconds and often occur dozens of times every hour. When your breathing pauses due to a blocked airway, you will awaken from sleep to continue breathing. In most cases, you will not recall waking up several times throughout the night. Daytime tiredness- Are you tired throughout the day, although you slept for 7-8 hours at night? As mentioned before, sleep apnea causes pauses in breathing which will alert you to wake up throughout the night. When this happens, you never fall into a deep sleep which is required to rejuvenate your body for the next day. Constant daytime tiredness could be a strong indicator of sleep apnea, especially when experienced with some of the other mentioned symptoms. High blood pressure- If you have high blood pressure, there may be an underlying issue such as sleep apnea that is causing this. When you stop breathing during sleep, your blood pressure tends to spike and may remain high throughout the day. Irritability and moody- Have others noticed that you have become irritable or have mood swings? Perhaps you have noticed this as well and have never put any thought into it. Lack of quality sleep caused by sleep apnea can really wreak havoc on your body and affect your mood. Most of us are cranky when we do not get enough sleep. If we lack sleep on a nightly basis, you may notice an overall change in mood. Morning headaches- When breathing pauses during sleep, your blood oxygen levels rise and blood vessels expand. The expansion of blood vessels can cause headaches which may be noticeable when you wake. Now that you know some of the symptoms of Sleep Apnea, if you suspect you may suffer from this condition, it’s important to contact your doctor for a further evaluation. Luckily, for those with OSA, there are excellent treatment options available. Here are a few that you may want to consider. Weight loss: If your sleep apnea is not too severe, your doctor may recommend that you lose some weight. Shedding a few pounds may be all that it takes to eliminate your sleep apnea. Unfortunately, apnea sufferers may find it difficult to lose weight because they constantly snack on high calorie, low nutrition food to energize them throughout the day. Being deprived of sleep will deprive you of energy and this can cause you to crave junk food which will make it near impossible to lose weight. 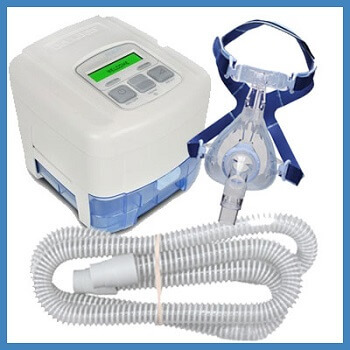 Continuous Positive Airway Pressure (CPAP) Machine: The CPAP is often referred to as the “gold standard” in the medical sleep industry. In most cases when OSA is diagnosed, a CPAP machine is often prescribed. CPAP machines have come a long way and are more comfortable than ever. Unfortunately, CPAP compliance is rather low for a number of reasons, mostly because the patient doesn’t find the right combination of machine, mask, and humidity level. Nasal Vents: A relatively new product that has quickly become popular are nasal vents such as the Provent. These are small flexible disks that almost resemble band-aids. They attach to the nose using an adhesive back and are disposed of each morning. Provent harvests the power of your own breathing to hold your airway open and prevent Apnea. Such products should only be prescribed by your doctor. Advantages of nasal vents are that they are compact, easy to use, and disposable. They also have a low up-front cost in comparison to a CPAP machine which can cost several thousands of dollars. Mandibular Advancement Device MAD: The MAD is a preferred choice for many. It’s fairly effective and can also be an affordable alternative treatment option for sleep apnea. These simple devices are inserted into the mouth and hold the jaw forward which tightens the airway and prevents it from collapsing. Mandibular Advancement Devices have been around for several decades but have only recently become quite popular thanks to their related product often referred to as a “snoring mouthpiece” which is used to prevent benign snoring. There are several distinct advantages that MAD’s have over traditional treatment options such as the CPAP. Perhaps one of its greatest features is that it is compact and does not require electricity to use. This is an important consideration for those who tend to travel frequently and don’t want to haul around a large machine and mask with them. Oral appliances fit in the palm of your hand and require very little maintenance. Custom fit MAD’s from your dentist will provide the maximum amount of comfort and generally last several years. Self-fitted mouthpieces are less expensive in comparison to the custom fit but do have one disadvantage which is they are not fitted and monitored by your dentist so you are unable to determine their effectiveness. 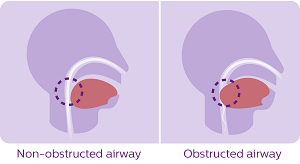 Surgery: There are a number of different surgery options for snoring, however, these are often not recommended as a first treatment option for OSA because they are not nearly as effective as alternative treatments and can often cause complications. The pillar procedure is a popular choice in snoring surgery. Implants are placed into the soft palate which causes scar tissue to form. The scar tissue becomes hard and prevents the soft palate from flapping around in the airway. Such surgeries should be considered on an individual basis and are not for everyone. It’s important to consider that snoring by itself is not deadly but rather when snoring is caused by a breathing obstruction such as obstructive sleep apnea. It’s estimated that 80% of those who have sleep apnea are currently untreated. If you suspect that you may have OSA, don’t guess if you have this dangerous condition. Speak with your doctor who can properly diagnose your symptoms. In many cases, snoring is simply benign snoring and is harmless with the exception of the damage that it can do to relationships. Where snoring is simply, well snoring, there are a number of snoring solutions out there that can help. One of the most effective solutions is the snoring mouthpiece which functions using the same concept as the mandibular advancement devices that are prescribed by your doctor. Snoring mouthpieces can be fitted at home using boil and bite technology. They usually cost between $50-$100 and are very effective, as I have found out. There are a number of different options to choose from, some better than others. Here’s a list of products that I have tested and reviewed. 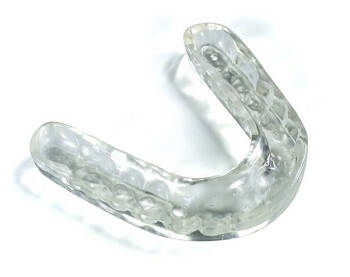 Next post: Can I Wear a Snoring Mouthpiece Instead of My Retainer? Previous post: Pregnant Snoring – Is it ok and will it stop after delivering?